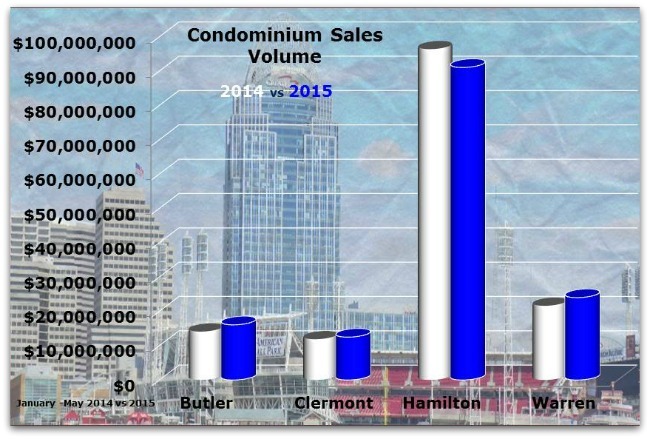 The nitty gritty on Cincinnati condo sales. Comparing the dollar sales volume and Hamilton County is behind last year- but Butler is the only county where sellers continue to see declining average sales prices. All sellers need to remain vigilant when it comes to pricing as the spring/summer market with lots of buyers starts to cool as people begin to take vacations. The highest price sale/closing during May occurred in Mariemont on a 1 yr old resale on West Street. The unit sold for $1,800,000. Butler County’s highest price sale was in West Chester on Cobblestone Walk for $239,000, Clermont County- on Valley Forge for $310,000 and Warren County- Mason on Falling Brook for $390,000. Questions Call/Txt about sale prices in your complex send a request for a full market evaluation.